Thanks for the suggestion! I agree with the meta having quite a bit of removal. It is always recommended to not overextend. In Edgar decks, keeping some creature spells in your hand is easy since you get value out of the tokens. 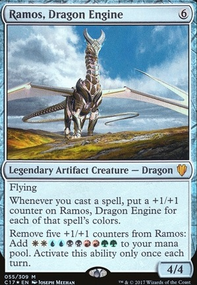 Ultimately, I am opting for items that can have utility outside of just board wipe evasion and have more functionality. My initial thoughts after seeing this list is that there have to be better cards for this deck than those in the vein of Lost in a Labyrinth or Shadowfeed that do very little outside of your combo turn. 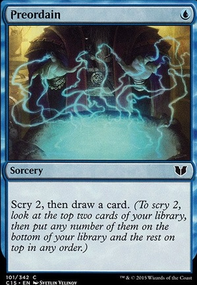 I'm pretty sure that Bolas's Citadel allows you to cast spells that don't have a mana cost without needing to jump through suspend hoops, which I think makes both Ancestral Vision and Lotus Bloom attractive during both your combo turns and your setup turns. I'd also strongly consider finding space for Yawgmoth's Will , Intuition , Impulse , Plunge into Darkness , Tainted Pact (this would require a different land setup), Mishra's Workshop , Lake of the Dead and Demonic Consultation . Sounds like it went well. 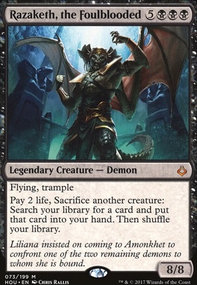 Must have been Whip of Erebos in your hand because Yawgmoth's Will you just cast for CMC3, play a fetch land, fetch a and Reanimate or in your case Animate Dead (unless it was counter/exiled with something like Dissipate . Oh another thing I'll mention, with Animate Dead it still works correctly, but the triggers/timing is important because the Karmic Guide is Protection: Black, the Animate Dead can still target it in the graveyard, but once it becomes an Aura, the Pro: Black removes it, with that on the stack (which inevitably kills the Karmic Guide ), stack the Animate Dead LTB first, then the Karmic Guide ETB, resolve the ETB, and then respond with the Kiki-Jiki, Mirror Breaker activated ability, then resolve the Copy Karmic Guide ETB to return the Restoration Angel , then the Restoration Angel ETB to flicker the Kiki-Jiki, Mirror Breaker then you can finally let the Animate Dead LTB resolve making you sacrifice the Karmic Guide . You'll have the exact same process with a Necromancy . 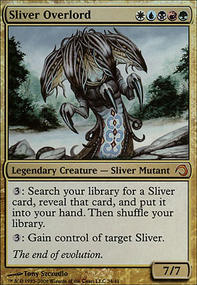 With Reveillark you can always pay the Evoke cost, which is a little higher I know, but it sacrifices itself, to trigger its LTB to return the Karmic Guide + Kiki-Jiki, Mirror Breaker . I always think about Entomb it's just wrong for this build. I didn't end of liking Teferi's Protection , it really needs Split Second, but it can be a fill in, it's not terrible, it can stop board wipe / control / sorcery speed combos / lethal / infect. Let me know if you have any other insights. The group play with the T10 win, I wasn't drawing anything. No tutors, no card draw. It was just almost pure mana every time with a couple removals and a couple A/D/D. So was mainly attacking with Kaalia of the Vast . During This game play, I had drawn into a Restoration Angel and a Reveillark before my tutors. I think it was either on T8 or T9 when I had put them both onto the field. T10 I drew into a Buried Alive > Kiki-Jiki, Mirror Breaker + Karmic Guide + Razaketh, the Foulblooded , Then I targeted Reveillark with my own Terminate to bring Kiki-Jiki, Mirror Breaker and Karmic Guide back onto the battlefield and since Restoration Angel was already on the field, game finally ended. 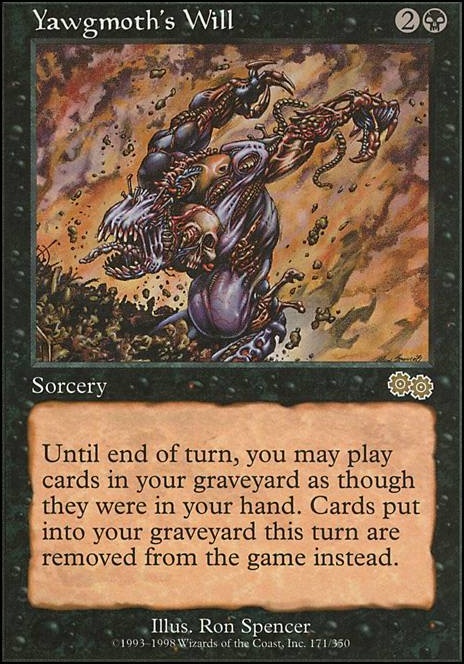 Also now that you mention using a fetch land out of the graveyard with Yawgmoth's Will , I would have won the game that I lost (but played until I won on T8, thinking back it was now T7) I Would have went infinite on T5. It had never dawned to me to use a fetch out of the graveyard. That was one of the games where I missed my T5 and T6 drop(other player went infinite on T7 and I finally did on T8, or technically I guess the end of T7, confusing it with T8) and needed only One more Mana to win, with a Yawgmoth's Will in my hand the whole time. You live and you learn. That's the thing about playing with new set ups, just have to get used to them. At least now I know for next time. But it's definitely going to take me quite a few game plays to get used to the deck and how it works, exactly what you mentioned. That much I understand; it's not going to be a perfect game every time. I'm sure i'll have misplays. I know i'm not answering in the order you asked but the reason I played Reya Dawnbringer in place of Hellkite Tyrant was because I didn't have it, which I thought I did. I only played five games, so it's hard for me to answer about anything being ineffective. I'll need some more game play to give you a legitimate report. The only thing I came across was the whole maybe having Necromancy in play over Whip of Erebos . That's about it for now. since I don't have Hellkite Tyrant , I might throw in Combat Celebrant in the meantime and see if I could take advantage of that. Don't know if i'll play with Entomb , not sure what card i'd replace it for. I like the target removals that are/were in it, I don't think i'll be removing any of those as of now. During one of the games, one of the pods did have Breya, Etherium Shaper and those removals were coming in hand.